Outdoor adventures await this summer - from horseback riding to soaring, exploring to climbing! 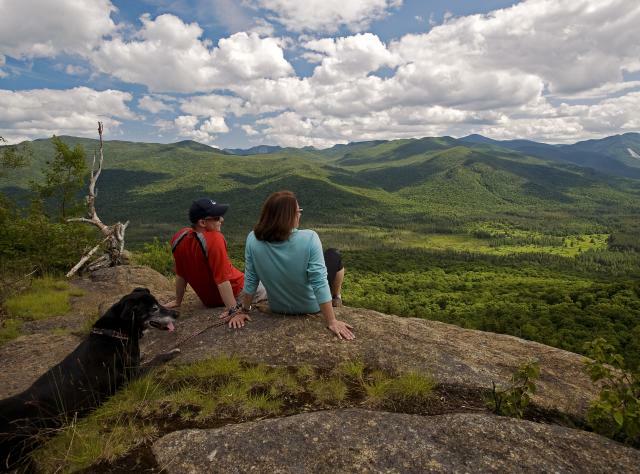 There’s plenty to explore in a New York vacation, and not all of it’s on the beaten path. Rock climbing beckons the daring at the Mohonk Mountain Preserve in New Paltz and Alpine Endeavors in the Catskills. Try whitewater rafting Hudson River Gorge, Black River and the formidable Moose River begin to churn with class three... four... AND five whitewater in the spring, but during the summer those rivers calm down to class one, two and three rapids. You can also try the Sacandaga where it meets the Hudson River in Hadley, the Black River near Watertown, rafting on western New York&apos;s Cattaraugus Creek through Zoar Valley, or the Genesee River in Letchworth State Park. Kayakers can also take the plunge through whitewater rapids of all levels. Road cycling and mountain biking promise early morning pedals or day-long travels through mountain scenery. Beneath that scenery, underground wonders await at Howe Caverns, a subterranean marvel of eerie rock formations, flowing sheets of molten stone, underground lakes and mysterious grottos. Join the happy miners at the Herkimer Diamond Mines and pry ancient quartz crystals from the earth. Explore Long Island landscapes at Deep Hollow Ranch. Here you can explore America&apos;s oldest cattle ranch on a horse-drawn living history tour with historical characters, cattle herding and horseback trail rides tailored for cowhands of all abilities. Or trot over to the Babylon Riding Center in Belmont Lake State Park for riding lessons and miles of trails. Bring your own horse, or ride one from the stable, when you discover The Crosspatch a working horse ranch in western New York. How about a sailplane soar? Only the whoosh of wind serenades your glider ride at Harris Hill Soaring Center. Or float skyward at a balloon rally. The Durham Balloon Festival, the annual Adirondack Balloon Festival and Binghamton’s Annual Spiedie Fest & Balloon Rally are among several where you can book your own free flight or a tethered balloon ride. Adventure parks like Adirondack Extreme, Sky High Adventure Park, and Chelsea Piers promise day-long fun on the lands of the Adirondacks with ziplines, rope swings, scrambling walls, hanging nets and wobbly bridges. Adrenaline Zone Paintball and Bulldog Paintball Park offer woods, meadows, and forts to defend. Just bring a keen eye and quick reflexes. Or relive the golden age of railroading on the Adirondack Scenic Railroad, one of many vintage trains that offer passage to earlier times.